Kafka Streams is a client library for building applications and microservices, where the input and output data are stored in Kafka clusters. Earlier we did setup Kafka Cluster Multi Broker Configuration and performed basic Kafka producer /consumer operations. In this post we will use multi broker Kafka cluster and demonstrate how to use Kafka Streams with word count example. Create Input and Output Kafka Topic: Create input & output topic with two partitions which will be used to publish & consume messages. Start Kafka: Starting Kafka on localhost and port 9091 and 9092. 1. 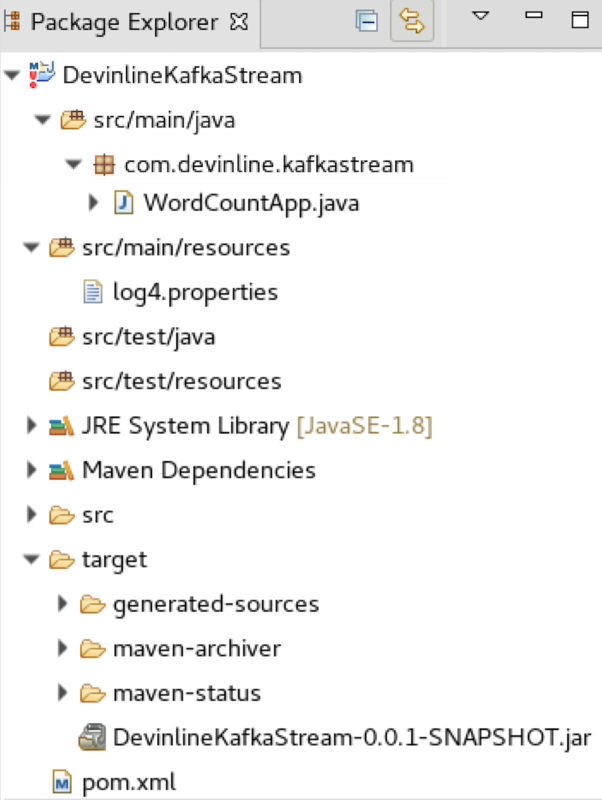 Create a Maven project and modify pom.xml with following dependencies. 2. Create a file log4.properties in resource directory and add following properties. 3. Create a Java class with following code. Below class listens to Input topic registered brokers (bootstrap servers) and publish message to output topic. This Kafka stream app process incoming textLine and split them based on space, keep on counting word and increments its count. 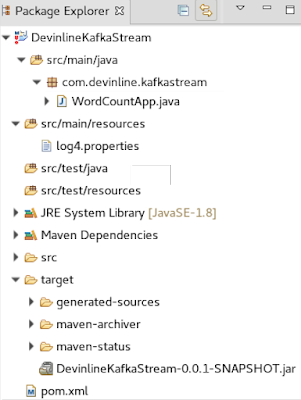 Start a Kafka consumer : This consumer reads message from output topic where message is processed and published by Kafka stream java client. Kafka Consumer message consumption: Consumer display word count processed by Java Kafka Stream applications and published in output topic. It is live stream processing. Kafka stream application Internal topics: Running a Kafka Stream may eventually create internal intermediary topics. These are two types of internal topic created - Managed by Kafka stream and used by Kafka stream. We should never use, delete or publish any message in it. It's internal so does not exist for outer world. Repartitioning topic: On transforming of key of stream, repartitioning will happen at some processor. Change-log topic: On aggregation Kafka Stream saves compacted data in topic. Scaling Kafka Stream application: Input topic we created earlier has two partition so we could spin up to 2 instance of Kafka Stream application. Most importantly Kafka Stream application relies on Kafka Consumer and we can add multiple Kafka consumer to consumer group. We will demonstrate this using two instance of wordCount app and launch two instance of WordCount app using jar. Export runnable jar from eclipse with dependencies say KSWordCountApp.jar. Spin two instance of word count app. Run below command in two different terminal. Observe log after starting instance-1 and how does it changes after starting instance-2. Count-repartition-0, word-count-input-topic-0] assigned at the end of consumer rebalance. Start instance-2 and again observe the log of terminal-1 and terminal-2 : Active tasks spliced between two word count app. 39121 [kafka-stream-wrod-count-e4f45acc-9b87-4eed-a0a1-b6a1c0bedf26-StreamThread-1] INFO org.apache.kafka.streams.processor.internals.StreamThread - stream-thread [kafka-stream-wrod-count-e4f45acc-9b87-4eed-a0a1-b6a1c0bedf26-StreamThread-1] partition assignment took 37 ms.
3114 [kafka-stream-wrod-count-94b574f5-d603-42d4-92da-cc9b74f4a651-StreamThread-1] INFO org.apache.kafka.streams.processor.internals.StreamThread - stream-thread [kafka-stream-wrod-count-94b574f5-d603-42d4-92da-cc9b74f4a651-StreamThread-1] partition assignment took 605 ms.
For end user change is not visible. Publish message and observe response in consumer, it will same as earlier. At any time we can shutdown instance-1 or 2 and it will not affect consumer working. Shutdown instance-2 and again observe logs. Instance-2 gracefully shutdown and active task list of instance-1 is same as when it was started with all four states. 1280475 [kafka-stream-wrod-count-94b574f5-d603-42d4-92da-cc9b74f4a651-StreamThread-1] INFO org.apache.kafka.streams.processor.internals.StreamThread - stream-thread [kafka-stream-wrod-count-94b574f5-d603-42d4-92da-cc9b74f4a651-StreamThread-1] State transition from PENDING_SHUTDOWN to DEAD. 1280475 [kafka-streams-close-thread] INFO org.apache.kafka.streams.KafkaStreams - stream-client [kafka-stream-wrod-count-94b574f5-d603-42d4-92da-cc9b74f4a651] Stopped Kafka Streams process. 1280475 [Thread-1] INFO org.apache.kafka.streams.KafkaStreams - stream-client [kafka-stream-wrod-count-94b574f5-d603-42d4-92da-cc9b74f4a651] State transition from PENDING_SHUTDOWN to NOT_RUNNING. 1328049 [kafka-stream-wrod-count-e4f45acc-9b87-4eed-a0a1-b6a1c0bedf26-StreamThread-1] INFO org.apache.kafka.streams.processor.internals.StreamThread - stream-thread [kafka-stream-wrod-count-e4f45acc-9b87-4eed-a0a1-b6a1c0bedf26-StreamThread-1] partition assignment took 205 ms.